MIAMI (Reuters) - Worries about a crackdown by global regulators on cryptocurrency trading could slow the pace of bitcoin's rise but should not threaten its existence, investors and market participants at a cryptocurrency conference said on Thursday. "It's impossible to ban bitcoin and cryptocurrency trading because the more you regulate, the more it will become popular," said Francesco Nazari Fusetti, co-founder and chief executive officer of Aidcoin and CharityStars, which aims to launch an online auction platform for the non-profit sector. 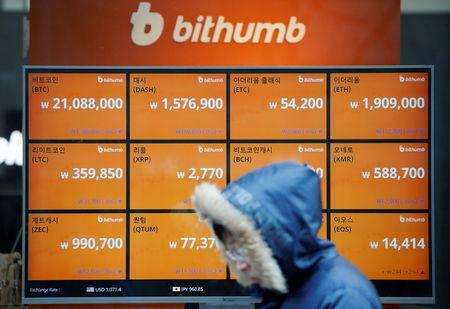 Bitcoin plunged to below $10,000 on Wednesday on the Luxembourg-based exchange Bitstamp after the South Korean news. On Thursday however, bitcoin recovered to trade at $11,718 , up 4.6 percent on the day. "Such intervention will further squeeze the already heated South Korean market, further drive up spreads to other markets, and push order flow outside the country," said Trevor Koverko, chief executive officer of Polymath, whose platform makes it easier for start-up companies to launch security tokens. "You have to think of what the general trajectory is and the general trajectory is upward for cryptocurrencies and bitcoin," said Eyal.